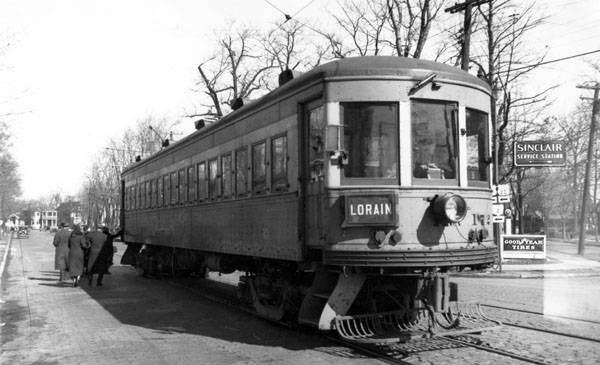 Upon reaching the city of Rocky River by way of the Cleveland Railway tracks on Sloane Avenue, Lake Shore interurbans made their first stop since leaving Public Square. Stop B was at the intersection of Sloane and Edanola Avenues. 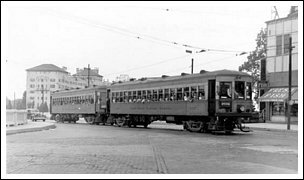 There was no station, and like most other locations riders boarded in the middle of the street where the interurbans stopped. 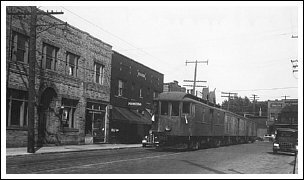 Coulter's drug store, located just to the south at the corner of Sloane and Detroit, was the Lake Shore ticket office for Rocky River. 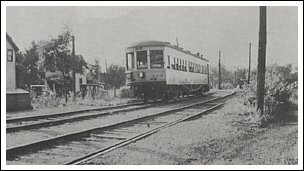 However, the cars did not stop here, presumably to keep the Sloane/Detroit interesection clear while passengers boarded and disembarked. 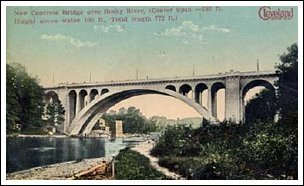 Technically these sites were located in the city of Lakewood, with the river being the dividing line between Lakewood and Rocky River. 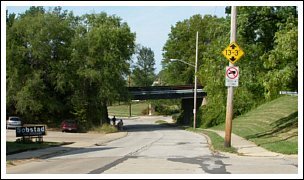 But for all intents and purposes they are always referred to as the Rocky River stop and ticket office. 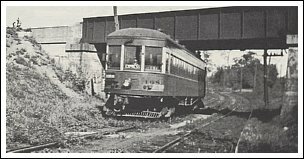 At Detroit Road the LSE left the Cleveland Railway's tracks and turned west to cross the Rocky River. 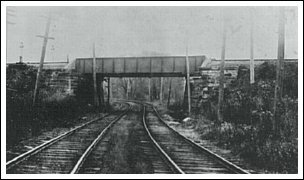 The bridge in place at the time was an iron wagon bridge with a road surface of oak planks built in 1890. 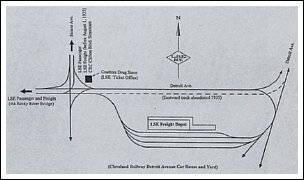 Although it was never intended for interurbans, the Lorain & Cleveland was permitted to lay a single track along the north side of the road way. 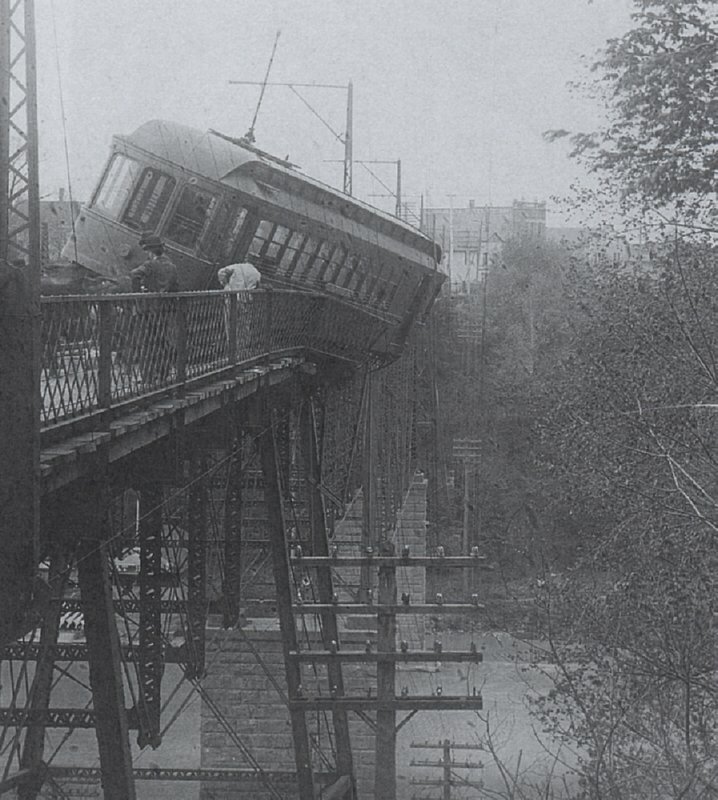 This arrangement lead to a nearly tragic accident on May 13, 1905 when LSE 64 derailed in the middle of the bridge. 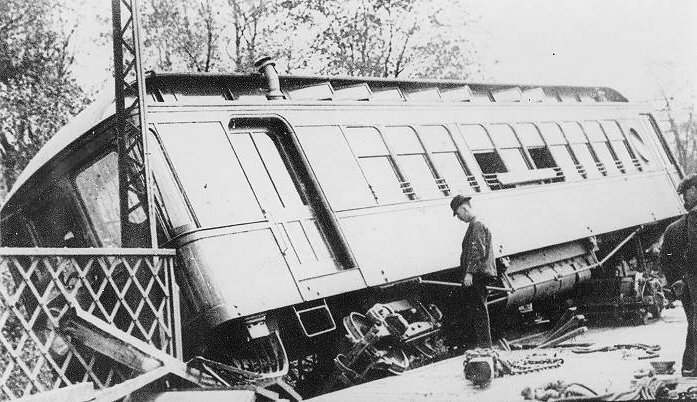 The front of the car broke through the railing at the side of the bridge and stopped just short of plunging into the gorge below. 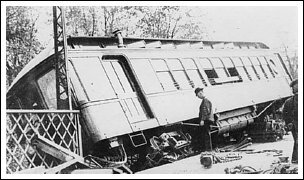 Reportedly the wheels of the rear truck jammed in the rails and the carbody remained attached to the truck, holding it at the edge and allowing the passengers to escape unharmed. 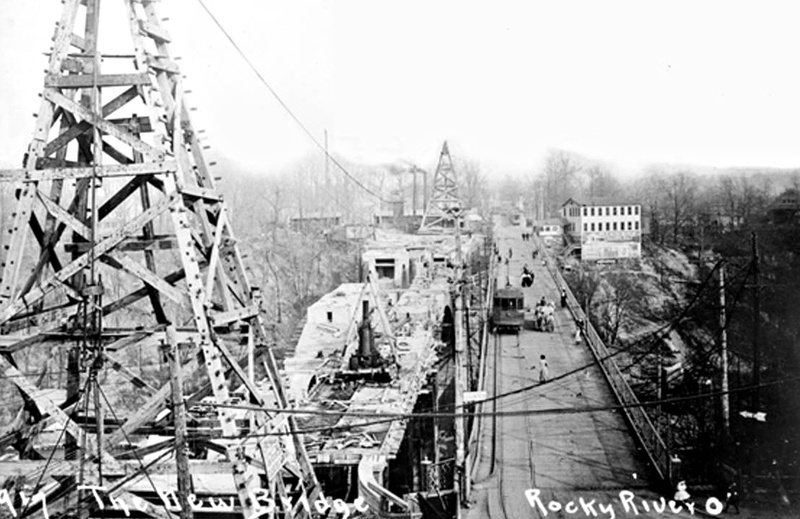 The spindly 1890 iron bridge was replaced by the new Detroit-Rocky River bridge, built between 1908-1910 along the north side of the iron bridge. 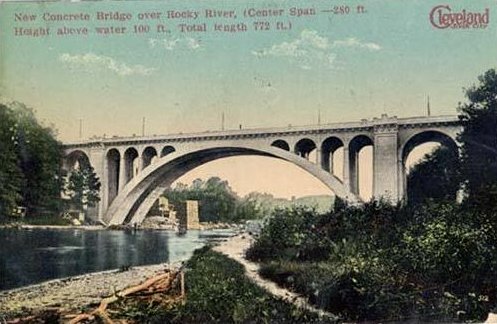 This substantial arched concrete span measured 60 feet wide and 708 feet long overall. 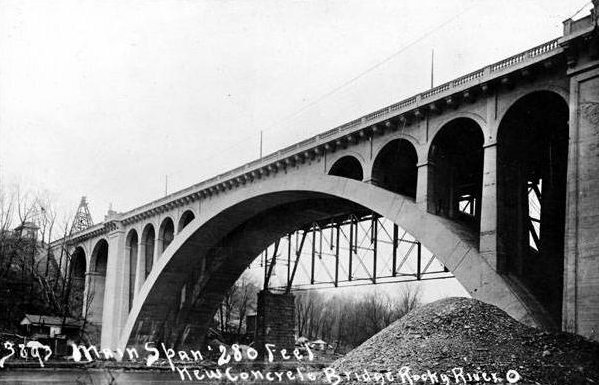 For a time it was the longest concrete arch bridge in the world, and remained the longest unreinforced concrete arch in the United States for the remainder of its existence. 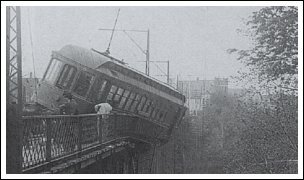 The Lake Shore's double tracks were laid in the middle of the roadway and interurbans crossed the bridge for the next 28 years without further incident. 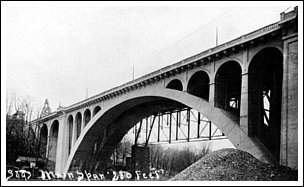 The bridge remained in use by auto traffic until 1980 when it was replaced by the current highway bridge. 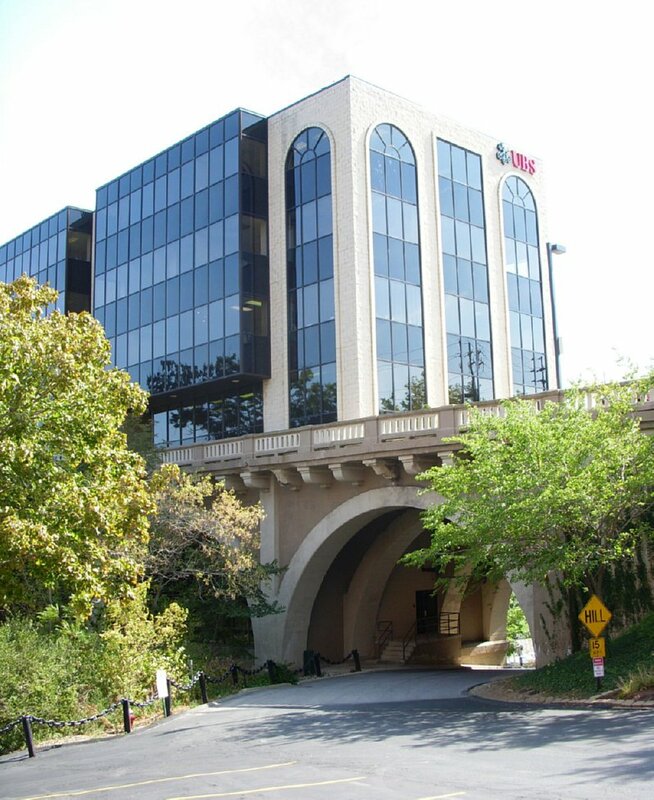 The old bridge was demolished except for the west piers which now form the foundation of a new office building, appropriately named the Bridge Building. 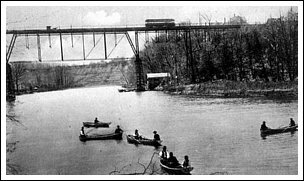 Interurbans crossed the river, passed the Hotel Westlake, and arrived at stop 1 immediately after crossing Wooster Road. 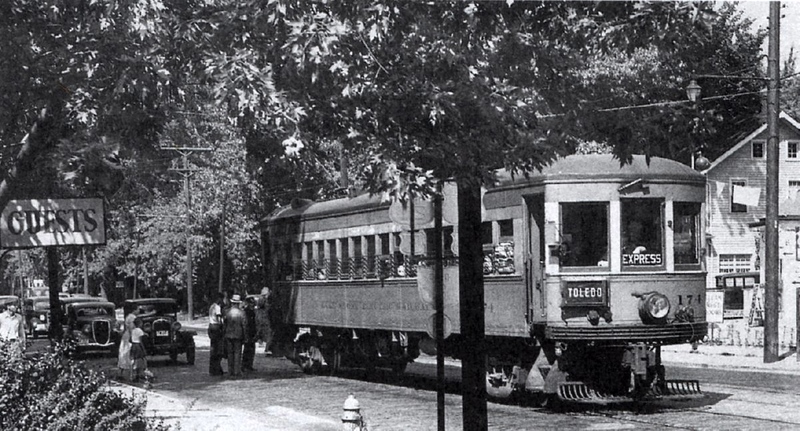 Here conductors used a phone box to call the dispatcher at Beach Park for final orders. 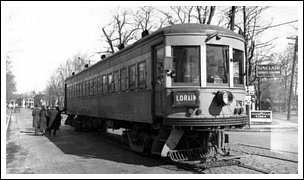 Limiteds would then make a non-stop high speed run all the way to Lorain, while local cars made any stops along the route where passengers waited. 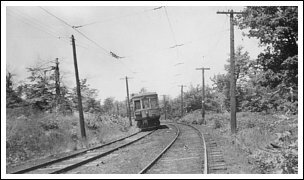 This point was also the start of the Lake Shore's private right-of-way, which was separate from city streets and allowed for those uninterrupted high speed runs between cities. 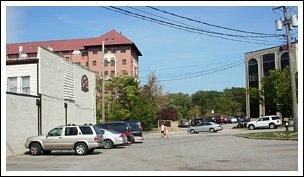 The site of stop 1 is now a parking lot for local businesses, directly across from the remains of the Detroit-Rocky River bridge. 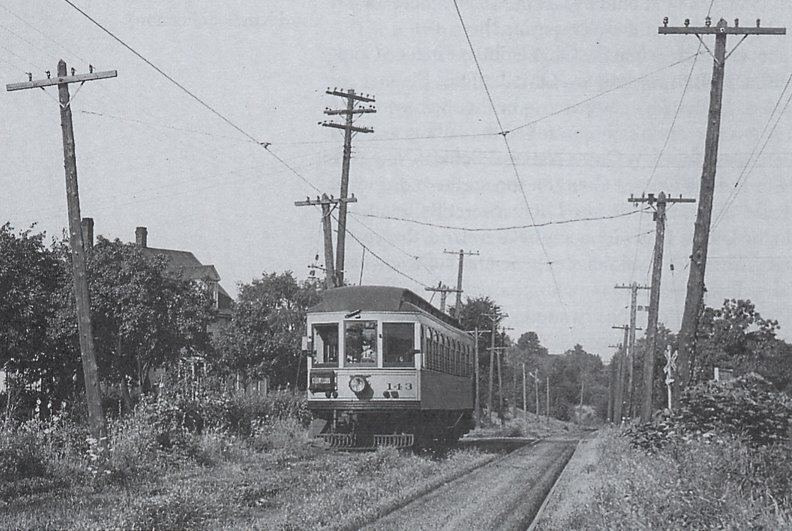 To the west of this point the right-of-way can be difficult to follow. 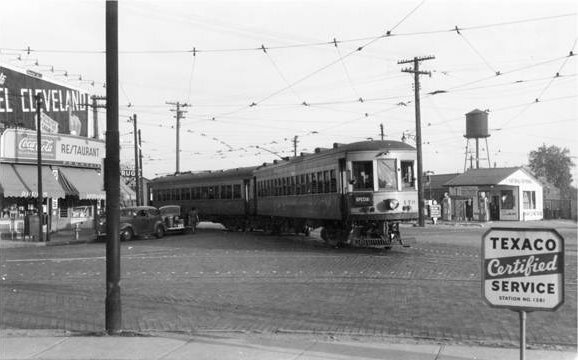 The interurban's path has been obliterated over the years by Detroit Road, which was relocated to align with the new bridge in 1980, and the building of new businesses and parking lots. 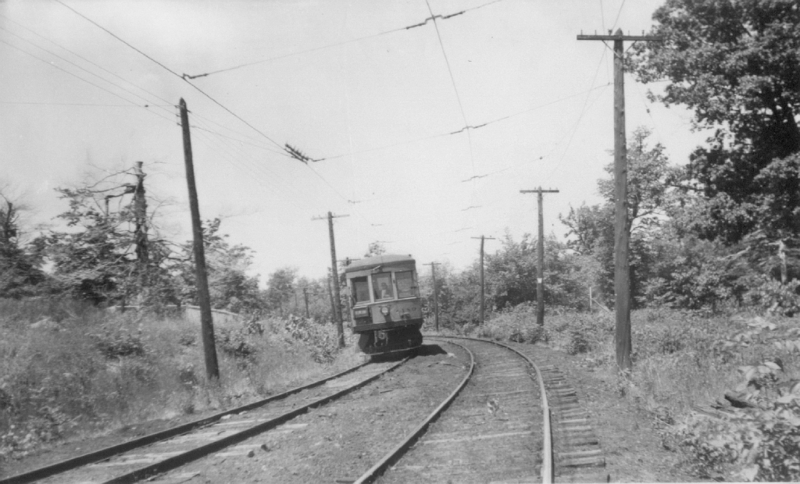 Just west of present day W. 192nd Street the tracks made an "S" curve to the north and crossed Detroit Road. 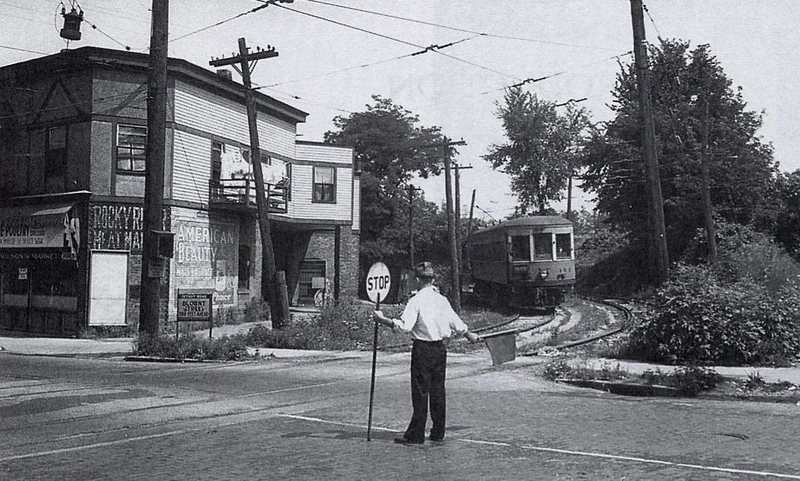 This point is seen in many photos from the 1930's and is noted for being the only location in which the Lake Shore employed a flagman, rather than electric flashers, who would stop automobiles as the interurbans approached. 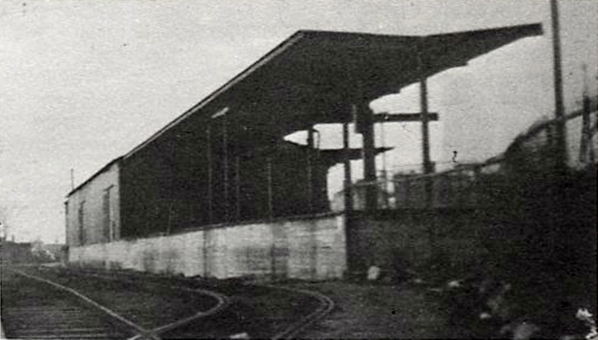 This was also the site of stop 2. 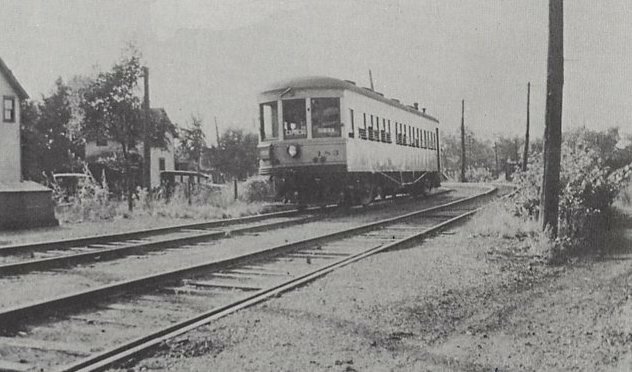 The tracks completed the "S" curve on the north side of Detroit Road and headed west parallel to, and about 200 feet from, the Nickel Plate Railroad. 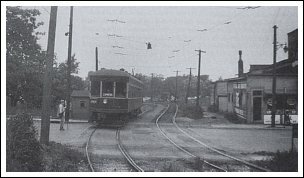 Local cars made stop 3 at Linda Street and soon after the tracks made another "S" curve to cross under the Nickel Plate. 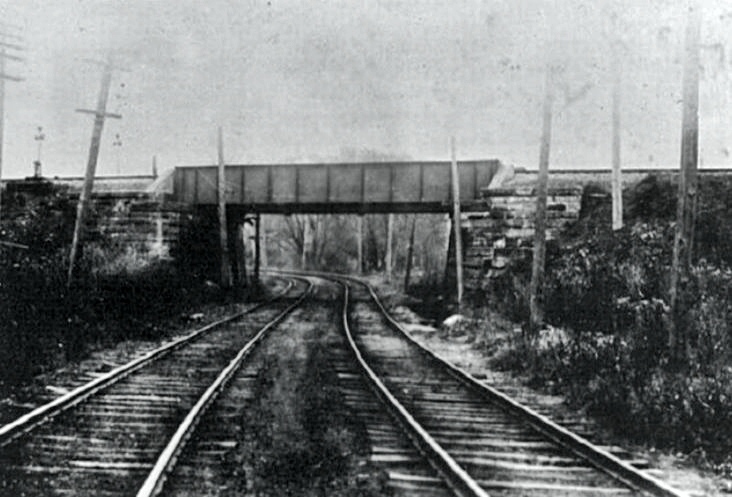 Built in 1897, this underpass was part of the Lake Shore's private right-of-way, but is now Smith Ct., a city street which still uses the Lake Shore's passage under the railroad tracks. 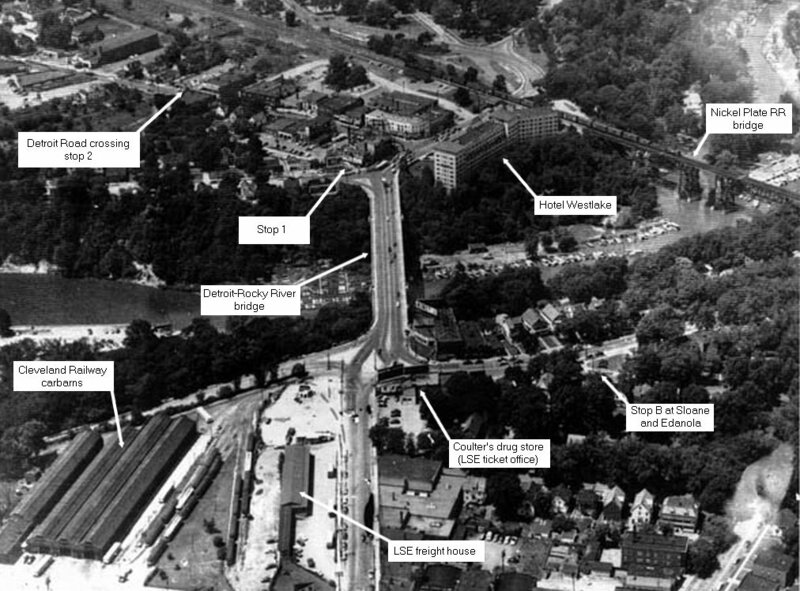 Smith Ct. is also the site for a "what might have been" story. 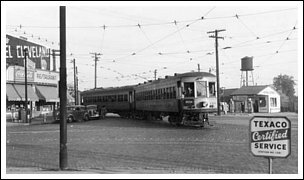 As explained on the Public Square page, the Cleveland Union Terminal was designed with interurban access in mind, and a platform was built for the Lake Shore to use. 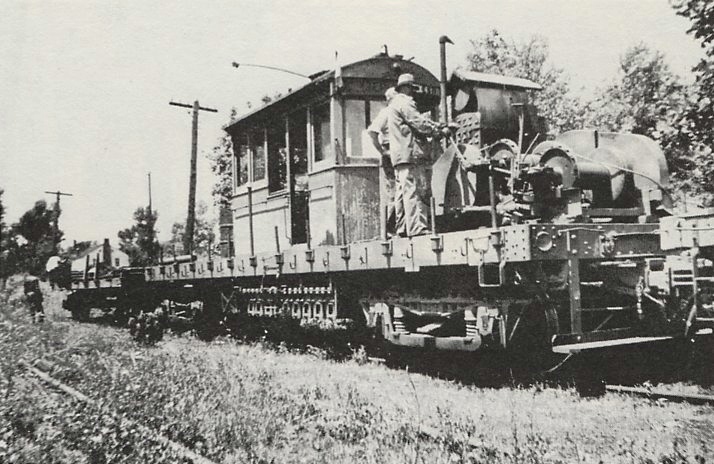 To provide convenient access the Van Sweringen brothers (the real estate and railroad barons behind the project) offered to let the Lake Shore connect with the Nickel Plate near present day Smith Ct. and use it's right-of-way to reach the terminal. 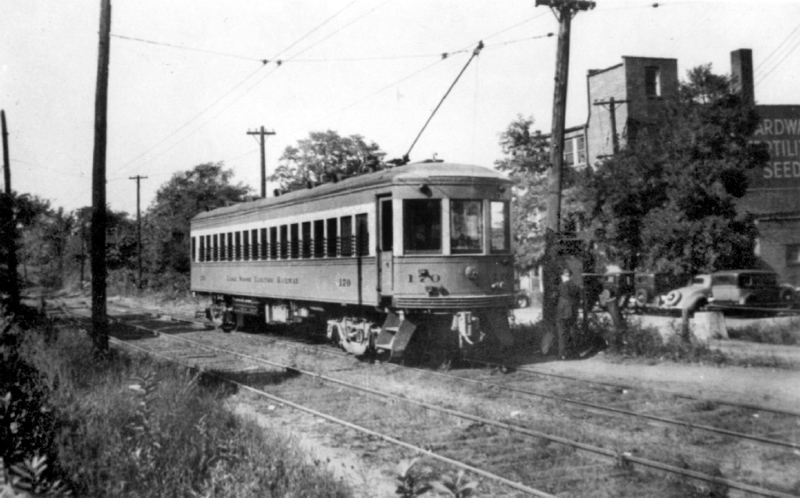 Bypassing the street level route through Rocky River, Lakewood and downtown Cleveland would have reduced travel time by 45 minutes. 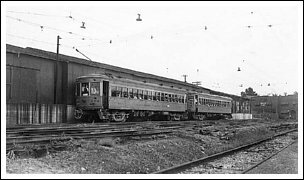 Such an advantage could have helped the LSE stay competitive and limit the dramatic decline in ridership that occurred in the 1930's. 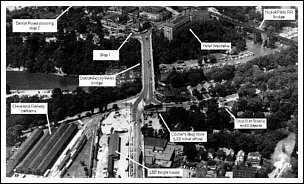 But when the time came the LSE could not afford to build the new interchange and had no choice but to continue using the street level route. 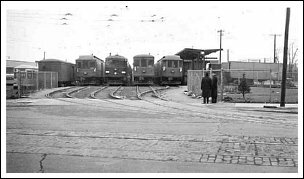 Between stops 4 and 6 (there was no stop 5) were a pair of rail sidings, one each on the north and south sides of the mainline, used for switching freight trailers. 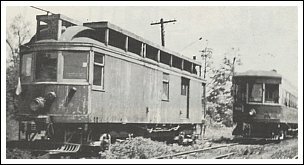 Like most towns along the line, Rocky River, Lakewood and Cleveland limited the size of freight trains the interurbans could move through town to three units (a motor car and two trailers.) 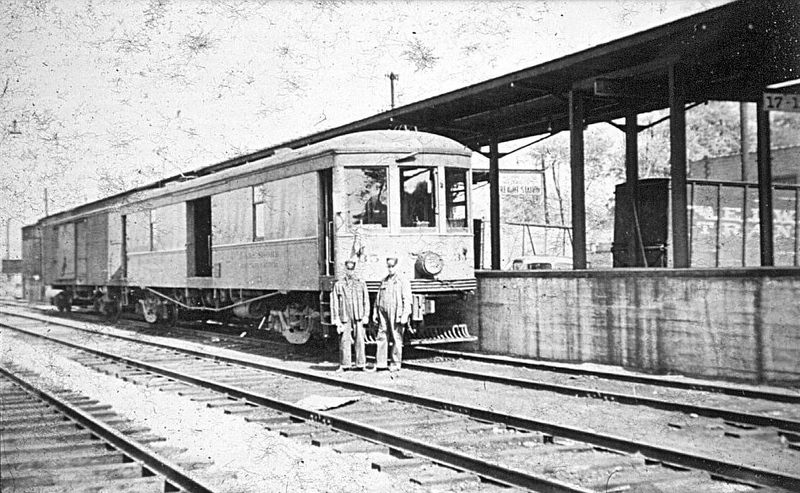 Freight cars arriving from Cleveland would be assembled into longer trains at this location for the trip west to Beach Park and Lorain. 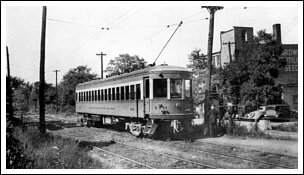 Those arriving from the west would be broken into three unit trains for the trip east through city streets. 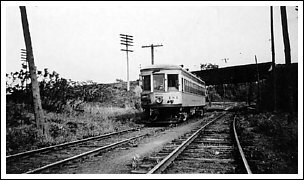 No structures or facilities existed here other than the sidings and a crossover track. Today Beaconsfield Blvd. 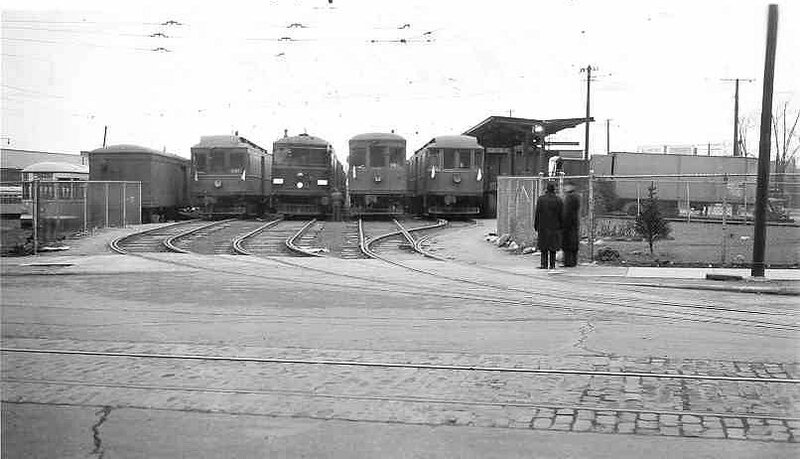 runs through the former site of these small freight sidings. 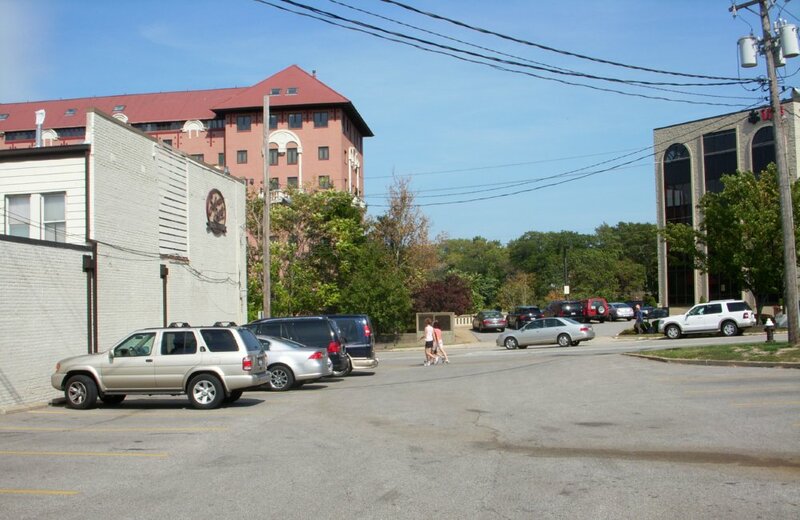 The landscaped median in the middle of the Boulevard is the former Lake Shore Electric right-of-way. 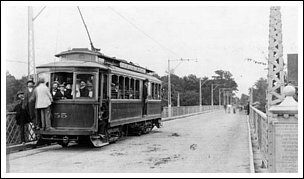 At the west end of Beaconsfield is Wagar Road, site of stop 6. 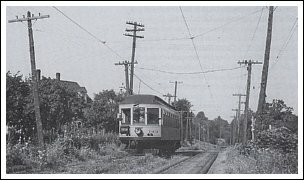 Continuing to the west other stops included Elmwood Road, stop 9 named "Hahns" for a farm that once existed at the site of the present day water plant, North Boylans Road (present day Pond Dr.) and Huminston Road. 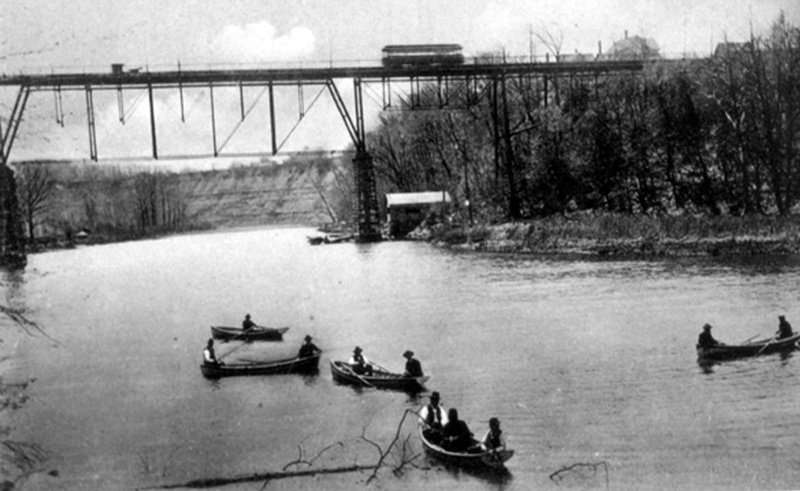 In later years Rocky River played an even more important part in the freight operations of the Lake Shore Electric. 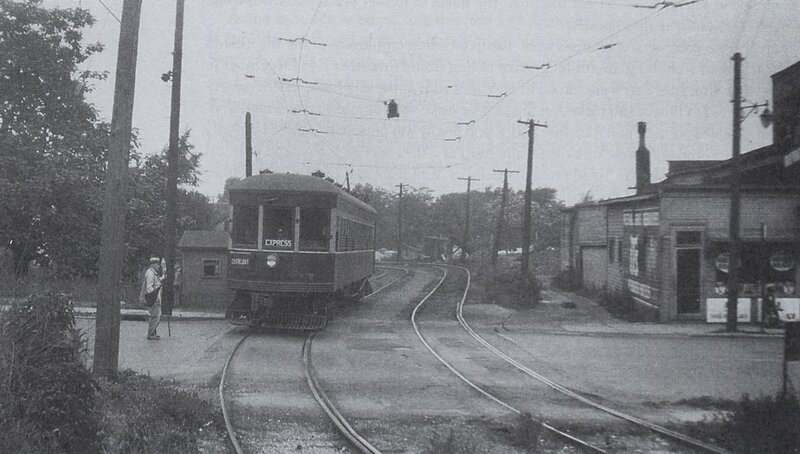 In 1935, after bridge closures and traffic difficulties severely curtailed the Lake Shore's access to its Eagle Ave. freight terminal in Cleveland, a new freight depot was built on the east side of the Rocky River, between Detroit Road and the Cleveland Railway's car barns. 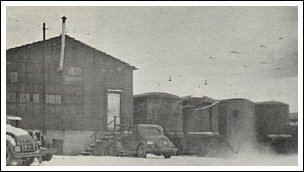 This smaller building served as the eastern freight terminal for the remainder of the Lake Shore's operations, with freight being moved to and from Cleveland by truck. 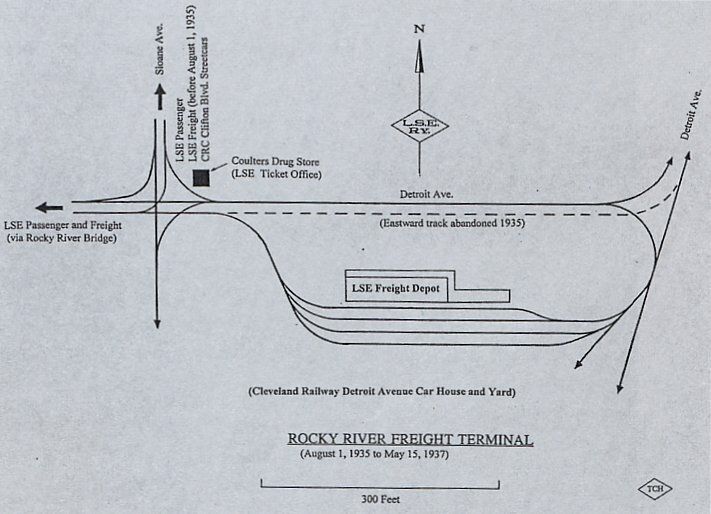 An interesting side note about the Rocky River freight depot is its use as a transfer point for passengers riding the baseball excursions to Cleveland. 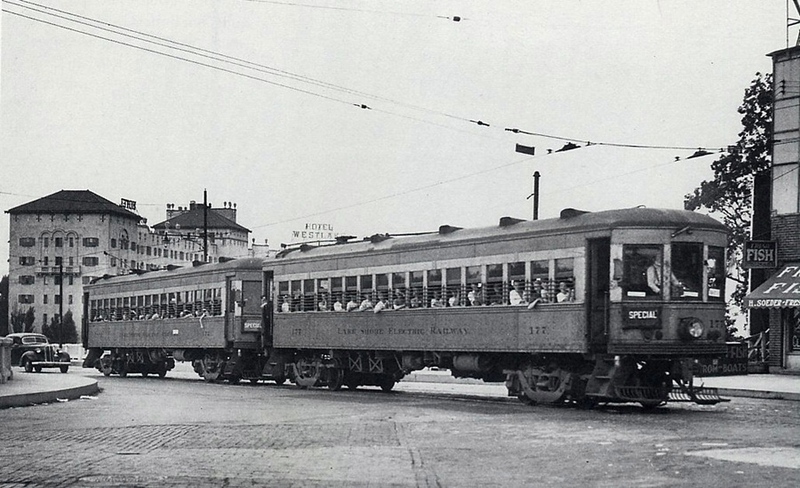 Lake Shore trains were often chartered by youth organizations to transport large groups of children to baseball games at Cleveland's League Park. 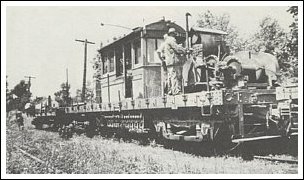 The Cleveland Railway's line to the park was one of the oldest in the city and considered too frail to handle the Lake Shore's large, heavy, multi-car trains. 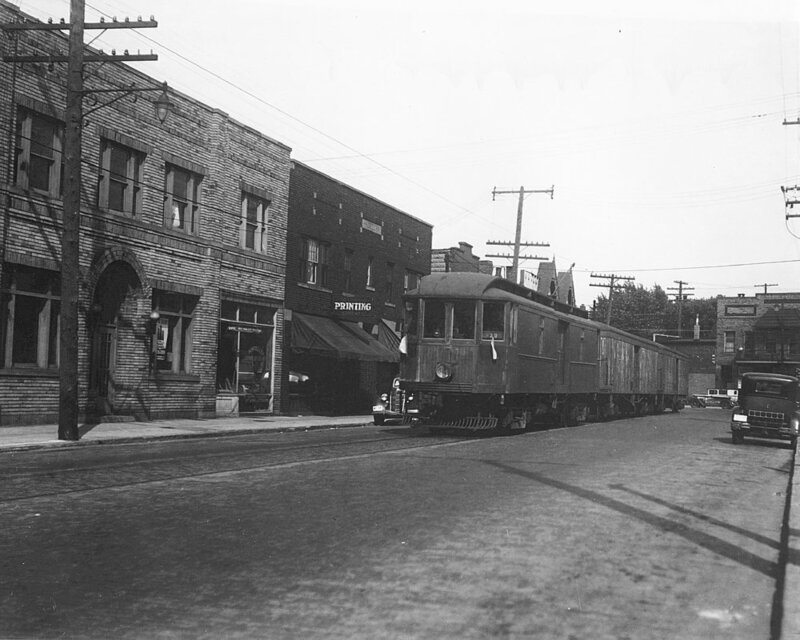 The LSE transported the kids to the Rocky River freight depot where they transfered to Cleveland Railway street cars for the final leg to League Park. 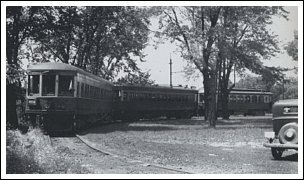 The LSE trains then waited in Rocky River for the return trip after the game. 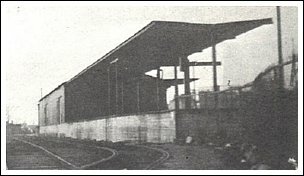 The freight terminal survived the end of the LSE and was occupied by United Moving and Storage until 1963, when it and the CTS car barns were demolished. 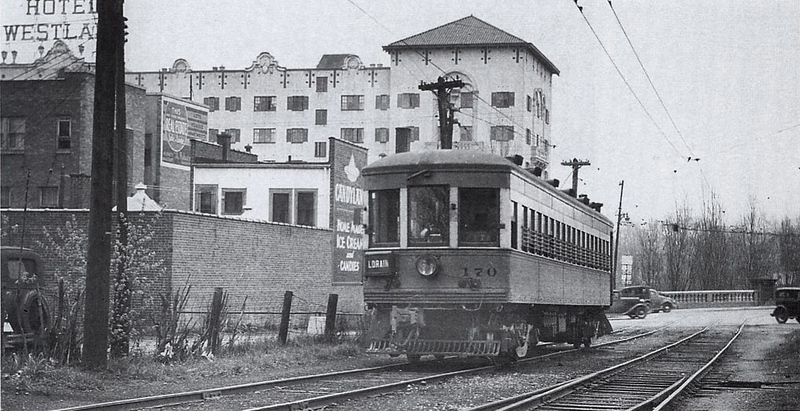 Today the Mayfair apartments stand on the site of the LSE freight depot. 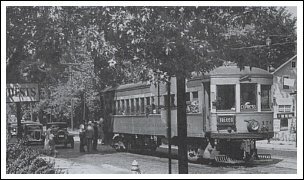 Passengers board at Stop B, at the intersection of Sloane Ave. 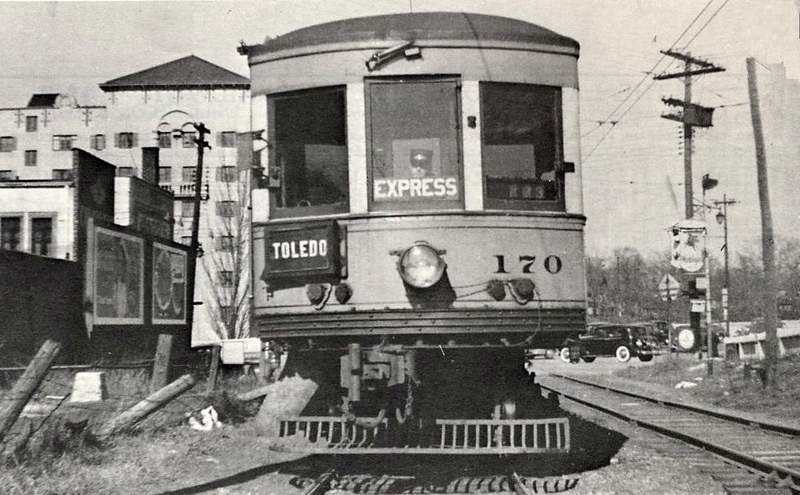 The Toledo Express makes its Rocky River stop. 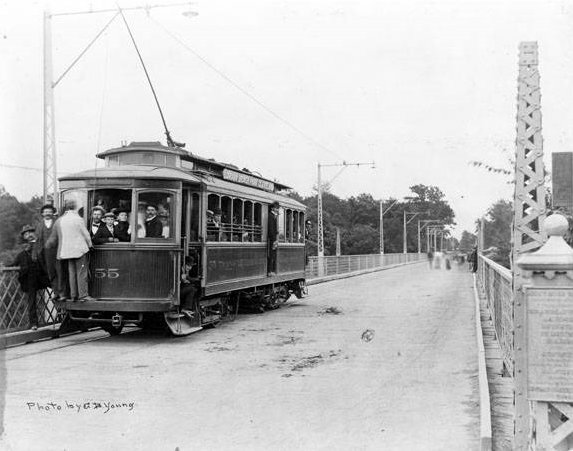 cross the Rocky River viaduct in the late 1890's. 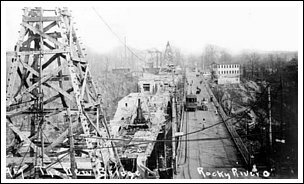 foundation of the aptly named Bridge Building. 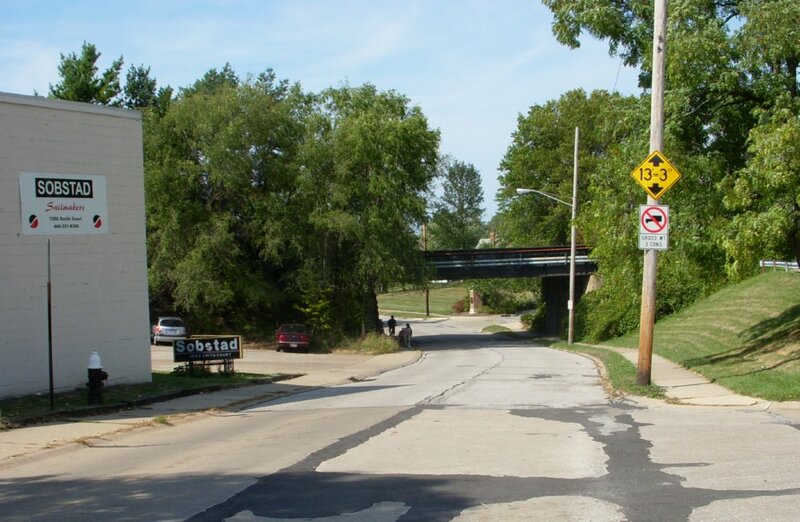 Same view as photo at left, the site of stop 1 in Sept. 2010. 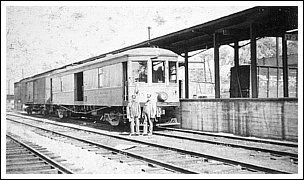 View of #170's conductor using the phone box at stop 1. 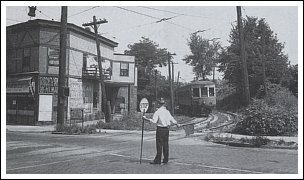 Good view of the curves at the Detroit Road crossing. 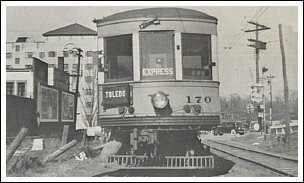 View from Detroit Road as Cleveland express heads east. 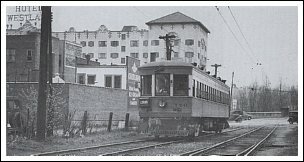 Cleveland bound #143 passes Stop 3, Linda Street, in 1935. 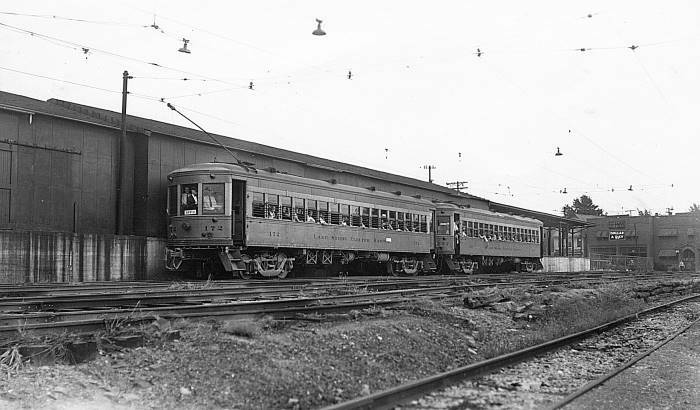 Eastbound Cleveland express passes under NKP in 1938. 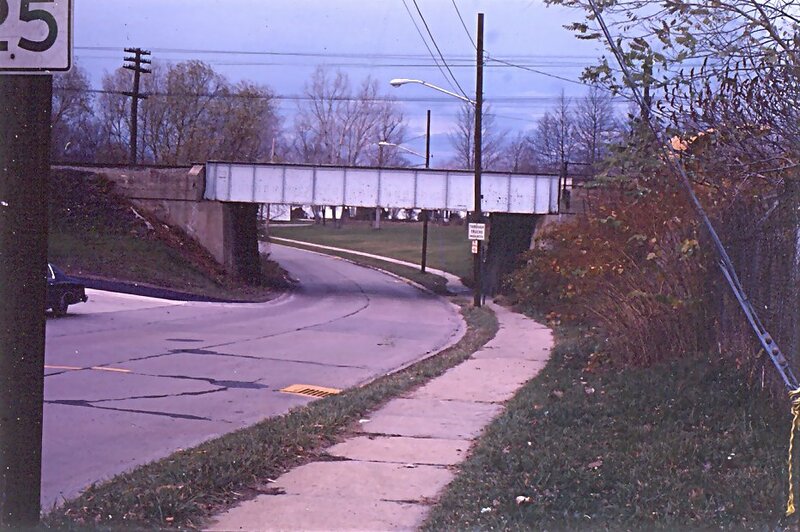 Same location as photo above, Smith Ct. in 1978. 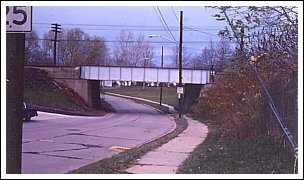 Trees concealing the Smith Ct. underpass in 2010. 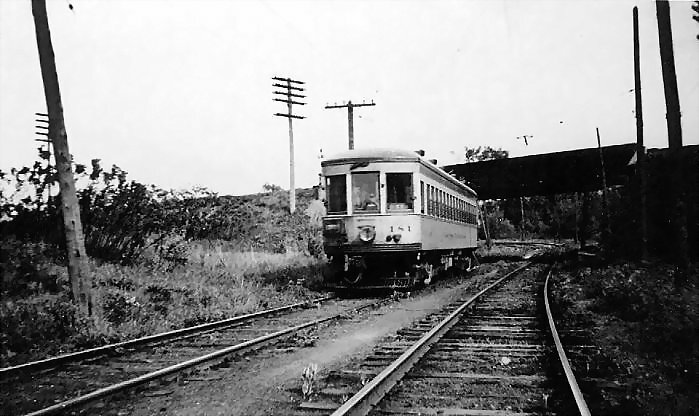 #180 eastbound approaches the NKP underpass in 1934. 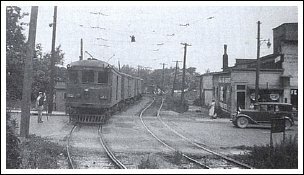 LSE and C&LE freight motors at the Rocky River depot in 1936. 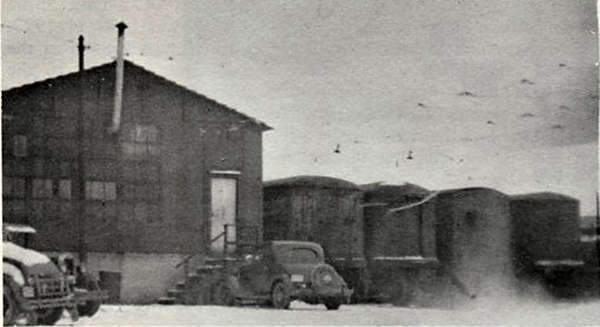 Box trailers lined up at the depot in the winter of 1937. Waiting on the turnaround track during the baseball game. 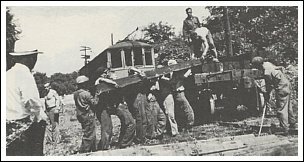 The sad job of pulling up the rails in August, 1938. 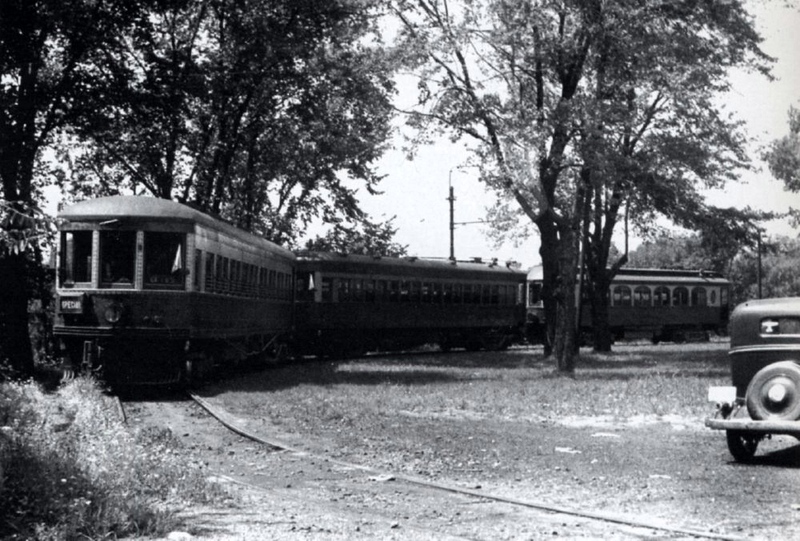 After the rails, the ties are pulled up and hauled away. Copyright 2013. 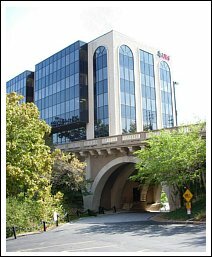 Site designed in partnership with Jason Shaffer Photography.